The Novotel Lille Ouest Englos is a 3 star hotel located in the calm leafy surroundings of Englos, 10 km from the centre of Lille and close to motorway between Lille and Dunkirk. Offering 124 rooms, a restaurant and a bar as well as nine meeting rooms fo. r conferences and seminars, this hotel is equally suited to a business trip or a weekend or short break in Lille with your partner or family. The hotel also features private parking and a swimming pool. Via the A25 E42 highway from the direction of Dunkerk, take exit No.7 and follow signage for Englos. 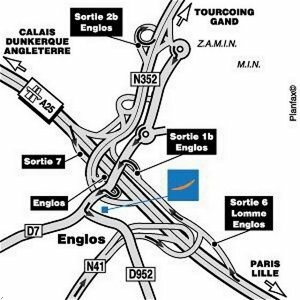 Via the A25 E42 highway from the direction of Lille, take exit No.6 and follow signage for Englos, on your left, over the highway. From Tourcoing viathe A22 E17 , take exit No.2b for Englos.